When it comes to hosting a destination wedding the typical gift registry etiquette varies by couple and destination. Since hosting your wedding abroad offsets your costs by having your guests pay their own travel/room accommodations, many couples skip an official gift registry. Many guests will choose to take gifts into their own control though, offering money or shipping gifts to the home instead of taking them with them to the wedding. No couple wants to be stuck attempting to take gifts home from their vacation. Don’t be afraid to think outside the box when it comes to a gift registry for your destination wedding. Many couples opt for simple Necessity lists or honey funds instead. The official Honeyfund website, for example, allows couples to create a wishlist and gift card registry in one place It also acts as a secondary website to share wedding details. 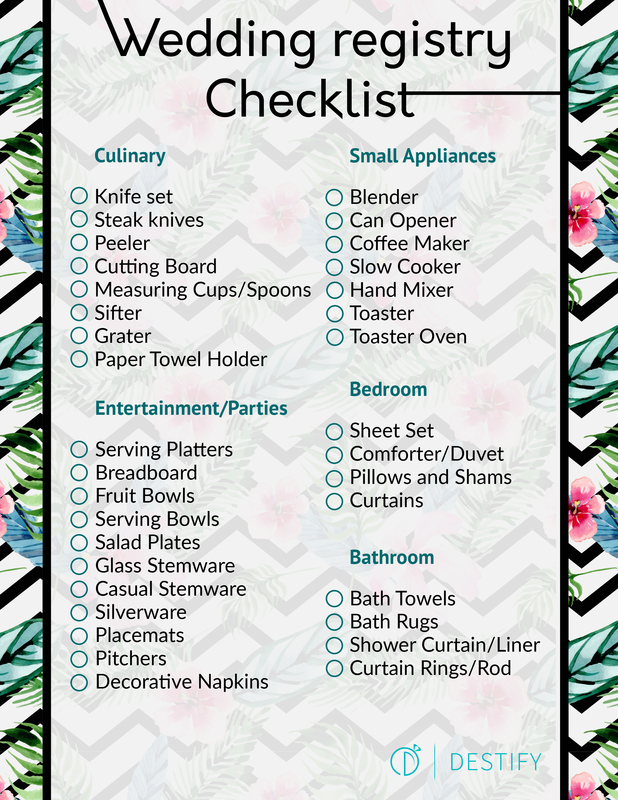 There will always be guests who want to give you gifts so having an optional registry, that feels nonmandatory, can be a great way to get some useful items for the home. Below, we’ve created a gift necessities checklist. We’ve reduced the clutter to very simple items that will allow your guests to purchase gifts within any budget. Don’t be upset if you don’t get everything, after all, your guests are already spending money just to attend your special vacation. This is also a great way for loved ones to help you celebrate the wedding even if they can’t attend, choosing to send a personal gift straight to your home as a way of saying, “Thanks for the invite”. Remember to send ‘Thank You’ notes after the wedding! Get a printable PDF version here. And you can view all of our handy destination wedding checklists here.